This is a document put together by CSA Laura Rhodes that contains a lot of information about troubleshooting steps for a lot of common control system problems encountered at events. On 8-slot cRIO, dip switches may have been inadvertently changed – all should be off with the possible exception of the “Console Out” switch. cRIO is not in communication (either wired or through the WiFi) – TRY PINGING! Driver’s Station computer has both wired and wireless ports enabled (and is confused). See Setup tab -> Choose NIC. If you want to be sure to use only the wired port, turn off Wireless completely either through the“Network and Sharing Center” or via an external switch on the laptop. No robot code installed - C++ debugging may leave cRIO in this state. Make sure the latest software updates have been applied to the Driver Station computer and any computers used for robot programming. Update the cRIO to latest Firmware version using the cRIO imaging tool. Reload robot application program after re-imaging cRIO. WARNING NOTE-FIRST may issue software updates up to and during the competition season. This is an inspection failure, not meeting the requirement of >10k Ohm between either PD battery post and chassis. Robot radio improperly powered. Needs to be powered from 5V regulator, verify polarity before powering up. WiFi interference – make sure all computers that have ever been used for Driver’s Station or robot programming that your team brings to competition have their WiFi ports turned off (even those still asleep in their cases). Excessive bandwidth used by the Axis camera – turn down frame rate and resolution to the minimum required for driver use. Check for CPU usage and memory leaks using “Charts” tab on Driver’s Station while running robot test. Motors pulse on and off and/or the message "Output not updated often enough"
Check that the motor safety is either disabled or that the motors speeds are updated periodically. The problem is that the watchdog isn't being "fed" and shuts off the motor signal every 100ms. This will be accompanied by a message that says "Output not updated often enough". Robot Application process crash due to user software bug or library/FPGA bug. Try to reproduce problem in the pit using the “Charts” tab on Driver Station and monitoring the Messages on the “Diagnostics” tab. For C++ and Java programs use the Netconsole program on the driver station to look for error messages from the robot. In particular the message "Robots don't quit" is caused by an uncaught exception in a Java robot program that is not caught. Remember though that the Netconsole is disabled on the field so you'll have to reproduce this one in the pit. Try running the robot in "Practice mode" from the driver station in the pit. 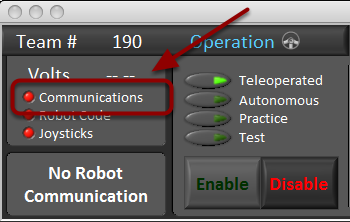 Often there is code in the autonomous part of the program that causes issues with the teleop. If the robot is only tested with the autonomous or teleop code separately, then those issues may never be seen in the pit. Improper delays loop/CPU usage in robot program. Use “Charts” tab and “Diagnostic” tab messages to diagnose. Vision processing taking too much CPU time. WiFi on Driver Station computer not disabled (only wired Ethernet used on the field and in the pits) and/or is set with a conflicting IP address. Driver Station plugged into incorrect operator control station. Windows Firewall should be disabled. Use of Analog Channel 8 for a different purpose and jumper is in wrong location. Tripped breaker for the corresponding circuit on the Power Distribution board – check break tripped LED on side of PDB. Check Proper connection of Spike Module to compressor motor. Check robot programming assignments for proper assignments of the compressor relay output and Pressure Switch Digital Input. Check for correct usage of the compressor object (there were subtle changes required in 2012 for LabVIEW compared to previous years). Check that Green LED next to Relay port on Digital Sidecar is turning on. Bad or disconnected PWM cable. PWM signal cable polarity. On the speed controllers, check for the “S+-“ or “B” in the plastic molding near the PWM ports. On the digital sidecar, follow convention printed near the PWM ports. PWM signal cable incorrectly plugged into DIO side of Digital sidecar instead of PWM connector side. Voltage or driving the motor from multiple areas of the code. Check with motor disconnected, multimeter on Volts DC setting. Use Dashboard or Smart Dashboard to display and check PWM control outputs. Speed controller type selected in the robot program doesn’t match the actual physical model of speed controller. Missing 6V jumper on PWM port on digital sidecar.